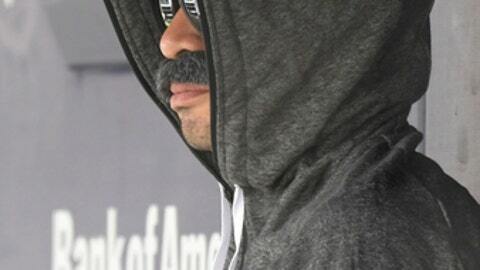 NEW YORK (AP) Just who was that guy sitting on the Seattle Mariners bench, the odd fellow with the bushy mustache, shades and a hoodie? Wait a second – it was Ichiro! ”He was perfect. I never would have known it was him,” Valentine texted to The Associated Press. Officially, Suzuki isn’t allowed to be in the dugout during games under Major League Baseball rules. The 44-year-old outfielder with 3,089 career hits came off the Seattle roster in early May and moved into the team’s front office as a special assistant to the chairman. Suzuki has been taking part in pregame drills and batting practice in a role similar to a coach. But he’s required to leave the bench when games begin, and that’s when he takes his place in the clubhouse – usually, anyway. Suzuki sat in the middle of the dugout, in the back row, in his shorts and occasionally crouched down while the Yankees swung away. He was gone by the second inning of Seattle’s 4-3 loss that completed a New York sweep. The 10-time All-Star hasn’t officially retired, and there’s speculation the Japanese great might play when the Mariners open the 2019 season in Tokyo with a two-game series against Oakland. This was Seattle’s only trip to Yankee Stadium this year, and maybe Suzuki wanted a final look at the ballpark. Or perhaps he was just showing off his playful side. The longtime manager liked Suzuki’s creativity.